Protein Source: Seagate has developed a unique freeze-dried 75% protein concentrate from whole sardines and anchovies. Seagate harvests these fish along the Pacific coast of Baja California, part of an abundant stable resource. These species inhabit the lower level of the marine food chain and therefore are free of toxins and contaminants found in the predator species such as shark, swordfish and tuna. Suggested Use: There is no better source of protein than fish, as long as the fish are pure. Nine (vegetable) capsules of Marine Protein per day provide 5 grams of protein, equal to approx. 10-15% of the adult daily protein requirement plus 246 mg. of omega-3 fatty acids. Marine Protein is ground into a very fine powder that is easy to digest, providing quick absorption and assimilation. Processing: The fish are cooked, pressed, freeze-dried, and ground into powder in Seagate’s state-of-the-art manufacturing facility. Seagate controls each step of processing. Purity: This product has been laboratory-tested and contains no mercury, pesticides, or PCBs. The fish used in this product are plankton-feeders, a level of the marine food chain that has not yet been subjected to the accumulation of toxins that may be found in larger fish species. Benefits: Marine Protein is a safe and convenient way to receive the full nutritional benefits from eating whole fish while eliminating the cooking, tasting and chewing. 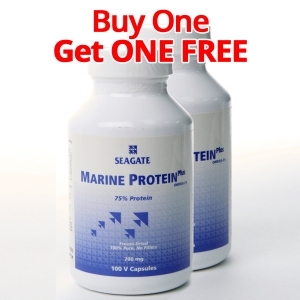 Marine Protein is a very rich source of amino acids with only 26 calories per serving. These capsules are easily stored at home or packed on trips, and can be taken in larger quantities as a temporary meal substitute during emergencies.